A trend sport conquered Switzerland: But how difficult is it to stand on a board to move with a paddle across the water? Stand up paddling (SUP) also called stand up paddle surfing, is a new sport which started in Hawaii and is now popular worldwide. 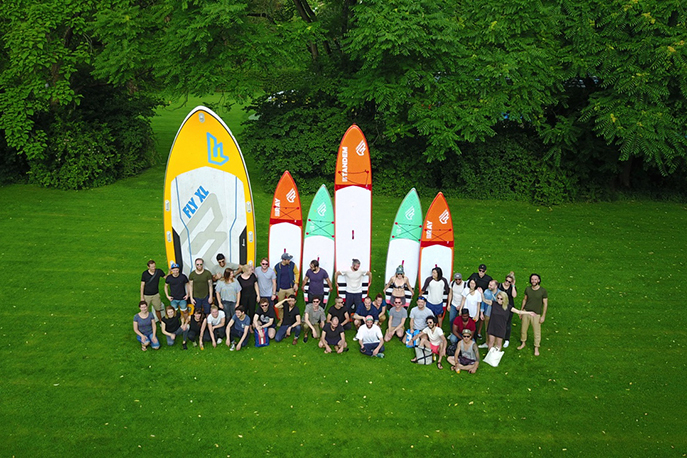 The history of SUP surfing goes back to the Polynesians who paddled their canoes over the coral reef on Tahiti standing up so they could fish. In SUP surfing you stand on a surfboard and paddle standing up with only one paddle. 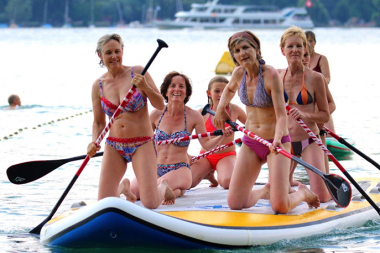 Stand up paddling is easy to learn although you will manage to do this better from the start and with the ideal posture if you do a brief introductory course first. This will also help you to be a successful stand up paddler quicker! This new watersport is already extremely popular in many countries and on Hawaii and America SUP surfing is already a mass sport. It's a great combination of surfing, canoe sport and fitness workout and can be learnt on flat, still waters in only a few minutes. In Switzerland this sport is still relatively new. Many use this opportunity of getting a full body workout, as in a gym, but only outdoors! Larger groups are divided and the SUP is combined with a second activity (e.g. Archery). 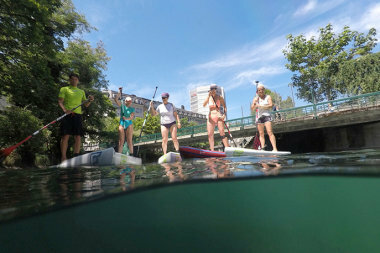 Having SUP as an item on the Adventure water course is also very popular.